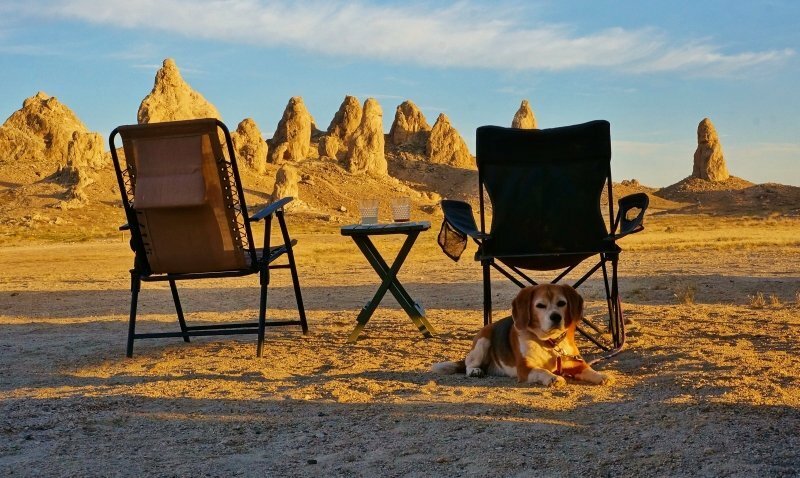 One of the many benefits to RV travel is the ability to bring along our dogs. For many people, their dog is more than a pet but a member of the family. 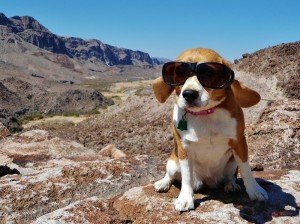 This is the case with my wife and I and our little beagle Angie. She is like a furry little child to us. For over four years now we have lived and traveled the country in our fifth wheel and Angie has gone everywhere with us. 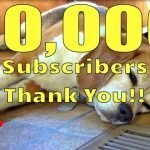 Over the years, I have learned a few things to make sharing the rig with our pooch a little easier and enjoyable for us both. 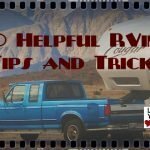 I hope you find the following tips and advice helpful if you are also planning on RVing with a dog. Unfortunately, many of our best friends tend to smell, drool and shed copious amounts of hair. They also have been known to upchuck and have the odd bathroom-related accidents. They are just facts of life when you are a dog. For these reasons if I was buying the rig all over again I would have paid more attention to the amount of fabric present in its décor. We ended up with two fabric swivel chairs, a sofa with fabric cushions and several areas of short shag style carpeting. All turned out to be magnets for beagle hair and her doggie odors. 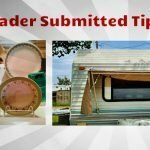 I’m actually in the process right now of renovating the trailers interior and top on the lists of upgrades is all leather furniture and vinyl type flooring. This should dramatically reduce our rig cleaning chores. Dogs are going to smell up the rig, no doubt about it, some breeds worse than others. 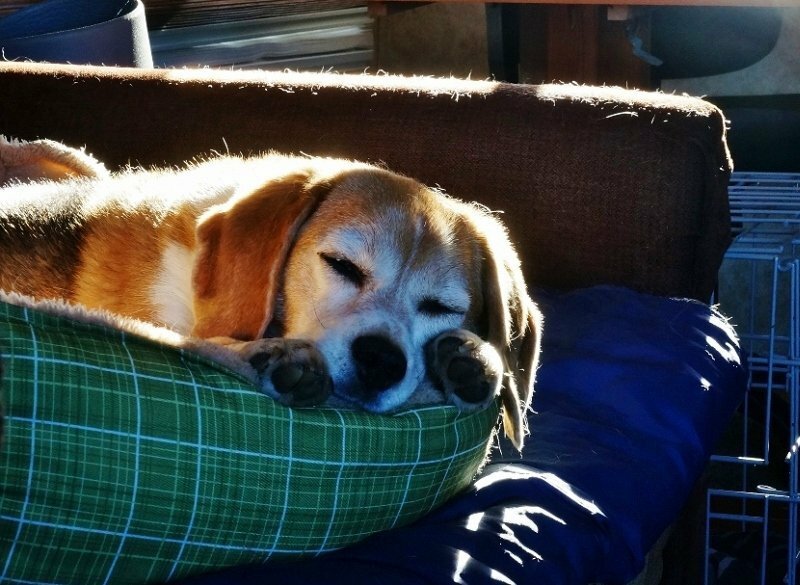 Our beagle is not super smelly as breeds go but she is a hound and does have a little oil to her coat. Plus she has been known to roll in some less than, shall we say, sweet smelling things. In my attempts to remove her smell I’ve tried many different cleaning products, some claiming to be pet specific and super-duper extra strength, blah blah blah. But in my experience a few simple tried and true cleaners do the best job. For fabrics like the furniture and carpeting, I use a little Bissell portable cleaning machine and fill it with a solution of half water then half and half of cleaning vinegar and borax detergent. For walls and hard flooring, I use good old Pine-Sol. I’m really glad I kennel trained Angie as a little pup. 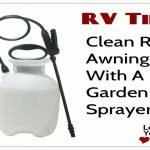 It comes in really handy as far as our RV lifestyle goes. 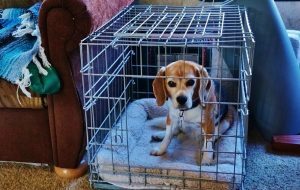 She sees her kennel as a safe place, a room of her own in the rig. 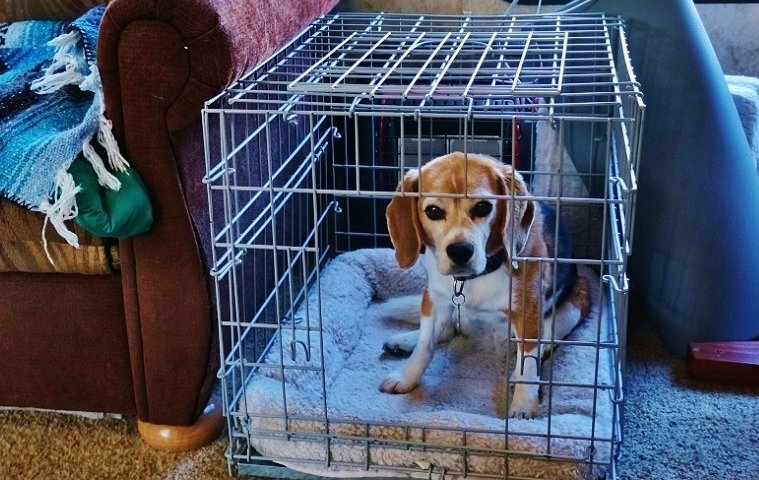 When we leave her alone in the RV she is left locked in the kennel. This keeps her from scrambling around the trailer trying to see out the windows, possibly damaging the interior or herself in the process. Another benefit to kennel training is for an unfortunate overnight vet visit. Or say you suddenly have to fly home for a family emergency and need to leave your dog at a pet sitter. Feeling comfortable in their own kennel will help lessen the stress. We use an open wire-framed kennel which gives her good visibility, good ventilation and will fold up flat if we need to store it. 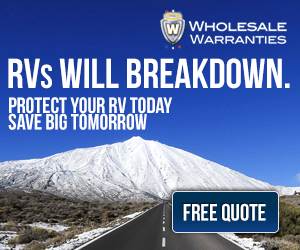 We often find ourselves out dry camping in our RV without the luxury of air conditioning. 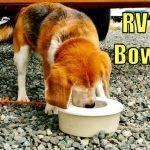 This is where having a means to properly ventilate the RV becomes very important to our furry companion. We’ve recently installed a powerful vent fan and it has made a huge difference, especially on those days with little or no wind. If I have to leave Angie in the rig without AC, I position her kennel in the coolest part of the RV away from the sunny side. Then I open a window near her and turn on the vent fan creating a nice breeze across her. Our fan has a built-in thermostat so it automatically comes on as the heat rises. I also place a wireless thermometer beside her kennel which records the max temperature she experienced. 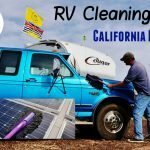 This way I learn when it is safe or not safe to leave her depending on the weather and how the RV is placed in relation to the sun. 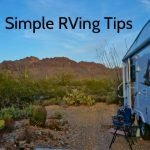 Don’t be that annoying RV in the campground with the incessantly barking dog or the one where whenever a person walks by the dog erupts in a frantic woof fest. Don’t just hope your dog never barks or howls when left alone. 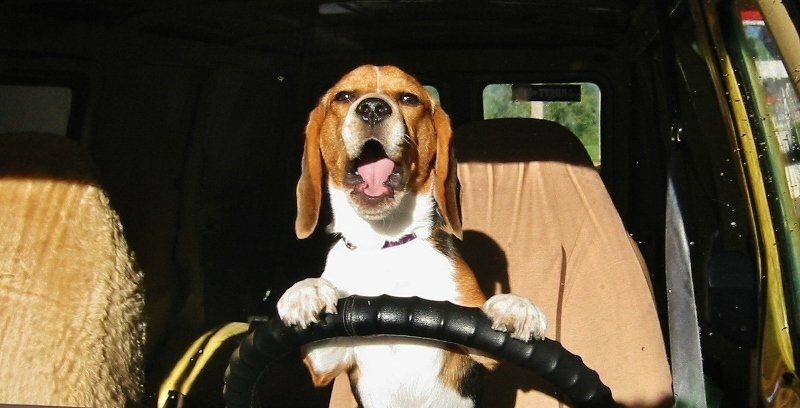 I always make a point of asking my RV neighbors if they ever hear our beagle howling or barking when we are away. Most people are too polite to come out and tell you straight out, but if you ask nicely they’ll let you know. I knew early on that Angie suffered from separation anxiety when I was away. 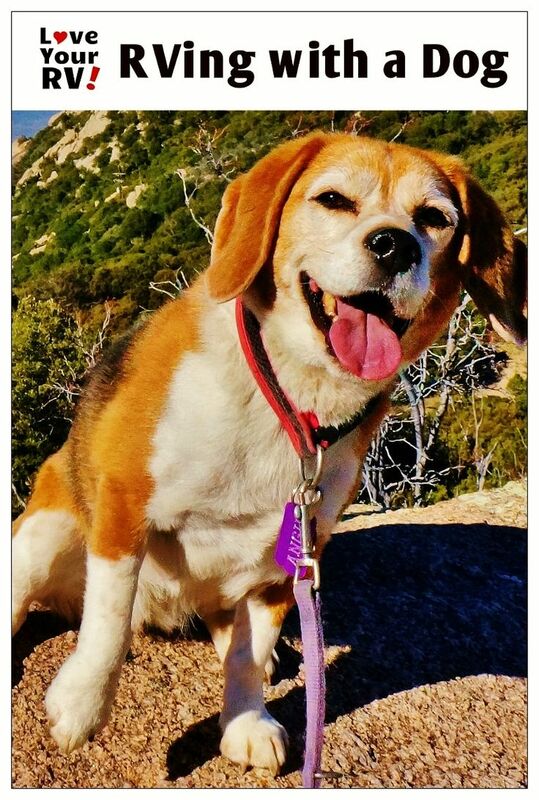 I was able to solve the problem with the aid of a bark control collar. It gives her a little electric shock if she barks and will increase in levels if she continues. She never got past level two before she soon learned that barking was a no go with the collar on. I at first wondered if I was being cruel, but now I believe it is less cruel than letting her get carried away barking and howling working herself into a frenzy. She is actually almost completely calm when the collar is on. Placing her in the kennel with all the blinds down also helps, keeping her from being distracted by outside things like people and dogs walking by the rig. I’ve also heard leaving a TV or radio on can help sooth a dog’s anxiety. When the fifth wheel was brand new we decided to limit the dog to the sofa, main area floor and her kennel. She is not allowed in the bedroom area and on any chair or table. This has worked out well for us as it lessens the amount of cleaning we have and helps maintain some authority over the dog. I’m glad we did it straight away as it was much easier to enforce the rules with the space being new to her than to have waited until she was used to having free roam of the whole place. 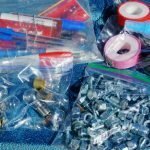 My final tip for you today is put together a first aid kit specifically for your dog. Your vet should be able to guide you as to what to stock for their personal needs. Examples of things I have in mine are pain medication specially formulated for the dog, allergy medication, doses of flea/tick/heart-worm prevention, vet wrap for bandaging wounds, eye and ear cleaner, etc. Also have the medications ready to go in the proper doses so you don’t have to think about it when the time comes.